Build Objective: Raise the best Skeleton Army imaginable! Skeletons! This build has been completely revamped from its original state; why settle for 18 Skeletons when you can have over 25! Thanks to the new changes to the Diviner's Vision set, wearing 3 pieces converts 100% Cold damage to Aether; now we can invest points in Skeleton Archer. Necro and D3 Necro have innate synergy between Commander of the Risen Dead and Master of Death: while one gives large %DA, the other gives nice flat DA, and Commander's large pet %Health helps keep the frail Skeletons alive. It does come at a cost of converting 100% of pet Physical Damage to Aether damage, but with Necromancer's passive Aether RR, it's easy to build around this concept. D3 Skeletons take Aetherfire since all of them are Melee Skeletons, while Necro Skeletons bind Twin Fangs to take advantage of their extra Vitality damage while giving themselves some health in return. Since the first iteration of this build, Frailty has changed from a flat RR targeted to the mouse to a stackable RR centered on the player. This ends up being a great buff to us as we now use Diviner's Mask and its flat RR modifier to Reap Spirit. As Ashbringer is a sword instead of a staff, it does not provide CDR bonuses, so our burst availability is not as potent. 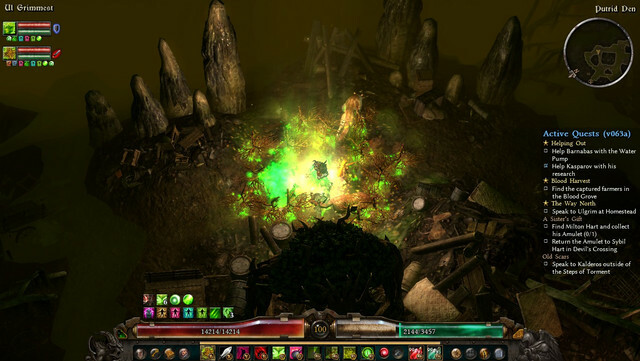 Call of the Grave is reduced to a 1-pointer, while Frenzy is still soft-capped as it has much better uptime. One other thing about Ashbringer: it has a Raise the Dead proc, but it procs "10% on Enemy Death." This has to be a typo; "On Enemy Death" procs only take place when the player kills an enemy (meaning pet kills don't count), so not only will it rarely happen for the summoner to kill things in a pet build, but have it only happen 10% of the time? I'm guessing you either meant 10% on attack or 100% on Enemy Death. As neither Necro or D3 Necro have the ability to heal their pets, we go for Tree of Life to give some sort of healing. Since Nature's Guardians is right around the corner, we take that in addition to the Armor nodes to better bolster ourselves against tough Physical hitters. You might want to bind Nature's Guardians is bound to Call of the Grave or Frenzy so that it only activates when you're unleashing against a dangerous foe, but this build is sturdy enough not to worry too much about it. In place of a green medal, we add Combat Medic's Mark to give extra healing to our pets. If you think your opponent is going to wipe your pets, explode your Blood Golem - Golem with the Vitality transmuter - to heal everything around it, including you. 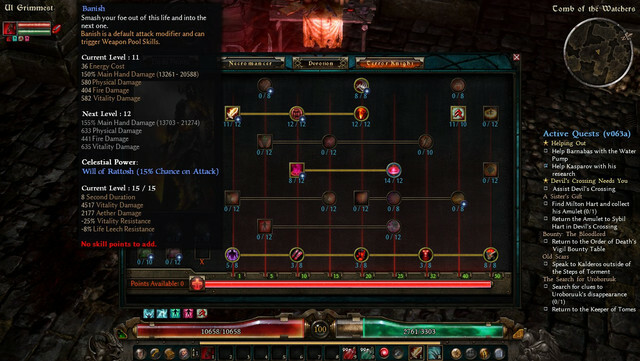 Thankfully, D3 Necro's Bone Armor keeps giving extra Physical Resistance after softcapping it, so make sure you invest fully into the skill to get the most out of it. Invest in RE + 12/12 decay for further Damage reduction and a great proc for Shepherd's Crook. Really enjoying your compendium! Quick question, how did you get your blood golem to work in the D3 Necro + vanilla necro build? 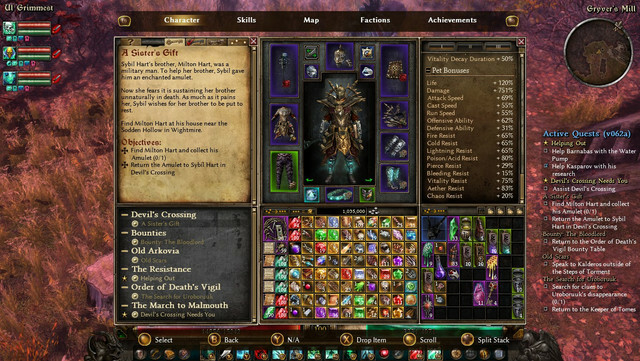 The current D3 Necro build in Grimarillion 62a causes a crash to desktop when the blood golem transmuter is used and you summon the blood golem (D3 mastery author has it fixed in the update this week, but it's not incorporated in Grimarillion yet). I've been wanting to try a similar build as yours, but with Spirit. If anyone was worried about this build causing the game to crash, the Blood Golem transmuter was fixed in Grimarillion version 63. Last edited by thepowerofmediocrity; 04-02-2019 at 10:17 PM. The build was revamped since the picture was taken, but how often do you see the whole gang bundled together like this? Build Objective: Make the best use of a Diviner's Set hybrid possible. 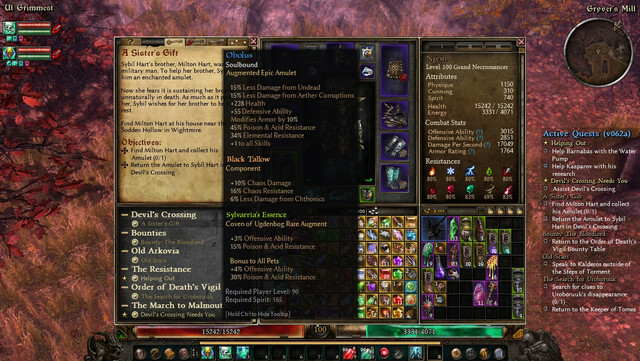 Pants: "Aetherfire" Bysmiel Pants "of the Flesh Hulk"
Medal: Satyr Craft with +Spirit Skills and Suffix "of the Wild"
Diviner's Set is a weak set for pet users as it only provides 90% Pet Damage among all 4 of its equipment pieces [Pet damage with Dark Covenant + Call of the Grave is still lower than the Skeleton build with zero temporary buffs activated]. In addition, the off-hand converts 50% Vitality to Aether, despite Reap Spirit having a large Vitality Decay component that cannot be converted and yet Reap Spirit's Wraith damage is Cold + Vitality. Additionally, there are very few equipment pieces that grant both Aether damage and pet damage that aren't already covered by the set. Spirit class has its share of issues as well. Between all of its pets, Spirit pets use Physical, Bleeding, Elemental, Vitality, and Aether damage. That makes it very difficult to take full advantage of their abilities. So what makes this build compete with the standard Skeleton build? As Spirit provides stackable Aether and Vitality RR along with a few hybrid abilities, I went for full-out Reap Spirit + 2 equipment pieces that summon pets on death. Combine that with lots of flat damage from soft-capped Soul Harvest + Diviner's Set bonuses and you feel like you're constructing an 10+ pet army with the bones of your enemies! One of the high points of the set is that the helmet grants 25 flat RR just from using Reap Spirit, so devotions can focus on going all-offensive. What the build lacks in Crit damage, it makes up in RR - lots of RR. 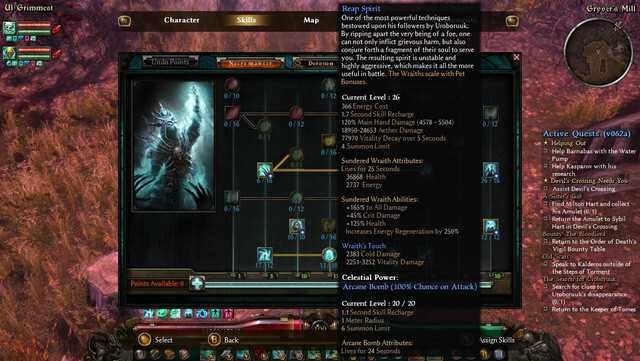 Spirit weapon is very much BiS - there's nothing that can surpass grabbing an additional 20% Aether RR while giving points in Spirit (a much hungrier Mastery than Necro, if you're wondering why I'm choosing it over the Mythical version). Dark Covenant is a mini-Hungering Void that grants total damage and speed to both player and pets; the health drain is not that significant, especially when you have 2 100% WD abilities alongside 18% Life Leech RR. Circle of Power also grants both player and pets Vitality and Aether damage- make sure you use it ahead of the other buffs to take advantage of the CDR bonus within the circle. 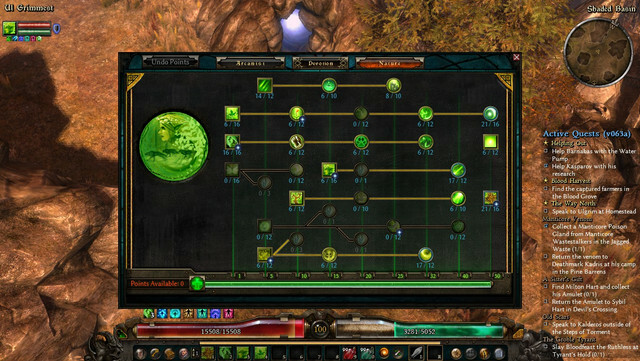 Bonescavenger Grips and Soul Prism relic grant multiple pet-scaled pets that spawn from player-caused deaths. Sadly, Soul Prism pets only do Physical Damage (considering the relic itself grants flat Vitality Decay damage for pets, the pets summoned On Death should also have Vitality damage), but Diviner's flat Vitality bonus makes 12/12 Soul Harvest feel almost like 22/12 Soul Harvest!. Both the amulet and Eurydice's Wedding Band are grossly OP, but the build has enough wiggle room in stats that even if the two items are nerfed, the build shouldn't drop that much in performance. Last edited by thepowerofmediocrity; 12-29-2018 at 03:10 AM. Build Objective: To combine a tremendous set in Blood Knight with a tremendous class in Terror Knight. 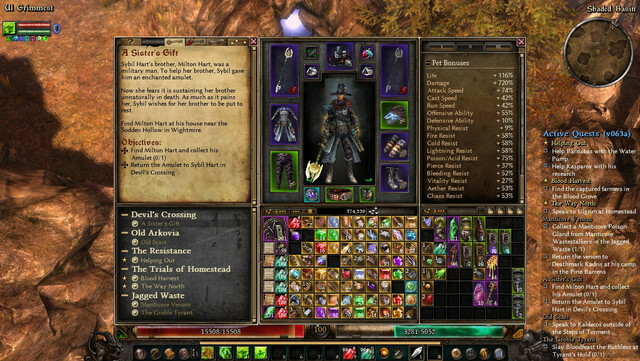 Belt: "Thunderstruck" Lunal'Valgoth's Girdle "of Shadows"
The Blood Knight set opened to much fanfare in build 1.0.6.0 - the amulet providing 4 mini-pets to throw Vitality orbs at enemies, and the whole set summoning the Soul of Narzan and its Vitality RR aura. The Necromancer and it's hyper-charged Bone Harvest ability is back for another go, but what class would it pair with, and what weapon would it take on its rampage? Enter the Terror Knight. A cruel slayer of demons, the Terror Knight enjoys inflicting its namesake onto its enemies. Aptly enough, the GD Necro + Terror Knight combo is referred to as the Horror. Terror Knight's great flat RR ability compliments the Necro's Vitality focus well, as it allows the player to run for Dying God + Rattosh without having to worry about missing out on RR. Add in the Soul of Narzan and additional Ethereal pets that have their own RR and you have enough RR that you don't have to worry about dedicating other equipment slots to make up for monsters' high Vitality resists. Rounding out the pets, Raise the Dead is back at it again, and Bone Harvest is one of the best skills I've personally experienced to reliably summon the Skeletons, especially since Mythical Iceskorn Talons has a chance to reset the cooldown of the skill. Terror Knight's default attack is Banish, which comes with 150% Weapon Damage alongside two nice damage buffs. The third node of Banish doesn't just give ~200% to all damage, but it converts 25% Physical to Vitality which is fully suited to this build's capabilities. 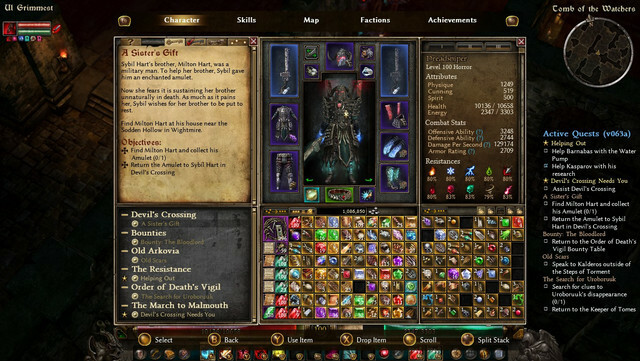 Banish's WD is further multiplied by the WD of the Horror's 80% for one of three WPS: Lust for Carnage has 114% WD, Reaping Strike has 134% WD, and Necrotic Edge has 160% WD. As much as I want to use a Melee weapon to take advantage of Terror Knight's two massive WPS as well as hard-capped Necrotic Edge and its 10 targets, there aren't any good 2H Vitality Weapons that give bonuses to either class. If you want to see a 2H Melee build that covers these WPS, I have a Terror Knight + Necrotic that is incredibly busted, though it's not in place in this thread due to no pets. Mythical Spirit Cannon's +2 to Necro Skills - as well as its 45% Physical to Vitality conversion - give it a solid edge over other weapons that have better bonuses but no class skills. The one benefit of choosing Ranged over Melee is that Terror Knight's Lust for Carnage fully pierces the enemy giving it good AoE capabilities. 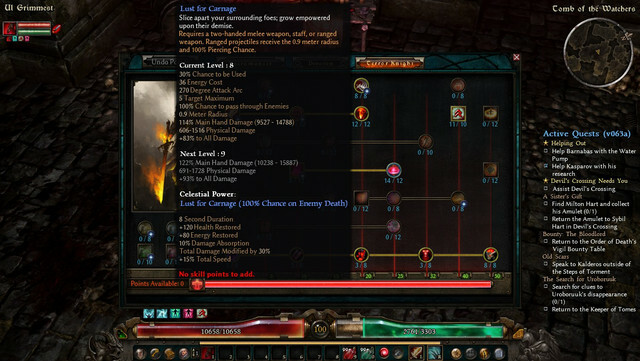 New to 1.0.7.0 is the Lunal'Valgoth girdle, and with it, 50%-60% of Fire Damage is converted into Vitality. With up to 60% Fire and 95% Physical converted to Vitality in your auto-attack, there is few left-over damage. Also new to 1.0.7.0 is a buffed Raise the Dead that benefits from Blood Knight's Aether to Vitality conversion, and Bone Harvest is one of the best abilities to proc it. There are no active healing abilities, but 52% base ACDTH (lol), Bloodthirster, and Ghoul makes up for Hungering Void and then some. To avoid running out of Energy, use only Bone Harvest for trash mobs and save the rapid fire for Boss-level and highly resistant enemies. Last edited by thepowerofmediocrity; 01-20-2019 at 02:09 AM. Forth Class Feature is Nature! If you want Summoner pet builds, look no further than GQ's Nature. Nature has a high concentration of pet skills; on its own, Nature has 3 Wolves, a Nymph, a Kodoma Spirit, Thorn Sprites, and Force of Nature. It is the most self-sufficient pet class that is not reliant on items to bring about extra pets; the first build that will be shown will demonstrate the power of having all of the pets working together - no need for Primal Instinct or other multiple pet-granting items. The Kodoma is an invincible pet who you can invest into 5 skills; the only skill that's worth investing full points into is the Level 50 ability. With it, the Kodoma blesses you and your pets with Elemental and Poison / Acid damage, flat OA, and additional damage + %OA for pets. Adding to the blessings, Heart of Oak gives 70% Health not just to pets, but to the player as well. It's the largest source of %Health out of all classes in the game, so you have little to fear from Health-reducing Auras. Investing points in the ability also gives you and your pets %Total Speed, so there is little reason not to invest 13/12 points in the ability. Onto the pets themselves: Investing 16/16 in the Wolves ability gives you 3 Wolves, making it an ideal skill to bind devotion abilities. The wolves also have a temporary buff that grants extra %Physical damage, %Total Speed and %Physical Resistance. The Nymph is an underperforming pet that has Physical and Piercing damage in the initial abilitiy, and by investing into its other skill, 30% of its Physical is converted to Elemental and its Piercing is converted into Acid. There is a bow that provides a second Nymph as a modifier, but the weapon is very underperforming for builds that benefit from the Nymph's Elemental or Poison damage. Thorn Sprites have varying degrees of duration depending on how many points you put in the transmuter: you can either have them as instant cast pets that live for only 3 seconds, or 4 pets on a 30-second cooldown that live for 30 seconds. Force of Nature is a Grimarillion addition to the GQ Mastery, and it is what the name suggests. It has the highest damage of all pets in the game, but its lower attack speed balances it compared to a pet like Shaman's Primal Spirit. The tree spirit has two stomp-like abilities and a root snare that gives stackable OA and DA debuffs. Nature has few abilities that aren't pet-related, but the skills it does have it universally beneficial to all builds, limited only by how many skill points you can invest in them. Plague is most known for its stackable Physical, Poison and Elemental RR, but the second node grants the bonus of reducing enemy damage - a highly sought-after debuff for squishier Mastery combinations. Briar Oak heals the player and any surrounding pets for 20% regardless of the number of points you have in the skill. Finally, you have access to the most universal skill in the game: Refresh and its Time Dilation-like reduction in cooldowns. Investing in the abilitiy increases the number of seconds brought down, but at the cost of increasing its cooldown. Most classes don't need longer than 6 seconds or so, so if you have enough bonus points in +Nature and good Cooldown Reduction, you won't need to invest any more than 1 point. Just to reiterate, though it is an active skill, Time Dilation does not reduce Refresh's cooldown, so no worries about broken invulnerability abilities. Thorn Sprites - the mischevious little elves that prick enemies with Poison damage - are at the forefront of this build. To get as many Thorn Sprites as possible while giving them appropriate time to reach enemies before they expire, we take 2/3 of the transmuter and stack as much CDR as you can get. ~42% CDR gives us a ~11 second cooldown for our sprites while the 6 sprites live for 20 seconds; with Refresh for some quick recasting when necessary, and you have plenty of opportunity to stack your sprites when the battle requires them. From where do we obtain this CDR? 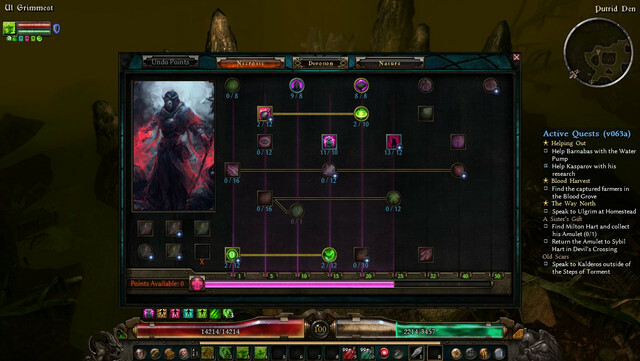 Thankfully, there is a class that provides Poison RR, CDR, and passive bonuses for few skillpoints: Enter the Necrotic. Instead of abusing its innate ACDTH, we take this class to provide the essential CDR and defenses while leaving as many skill points as possible for Nature. This is as close of a Nature pet zoo as you can get without simply going solo-class. Though we invest into at least the softcap into all of our pets, only Thorn Sprites and Nymph are capable of providing Poison damage of their own volition. To ensure all pets are capable of at least some Poison damage, +Nature Circlet of the Great Serpent and Poison Blight relic give a chance for pets to inflict flat Poison. Poison Blight also provides a pet-scaled Poison Pet, and coming alongside it is the Eldritch Hound from the Bysmiel devotion. There is not much room for healing in this pet build, so watch your UI for disappearing dogs and make sure you use your Briar Patch heal before you use Refresh. While Poison pets love to take Hungering Void and its massive Crit potential, the lack of wide-ranging AoE heals and no DA between neither the two classes nor the mandatory Poison Pet jewelry means that you must work your devotions for maximum DA potential. The Quill / Wolverine / Attak Seru combo - alongside Mogdrogen - gives the max DA that also has a T3 pet devotion, and Mogdrogen's Speed boost multiplies the chances of your pets hitting with their %Chance of Poison. 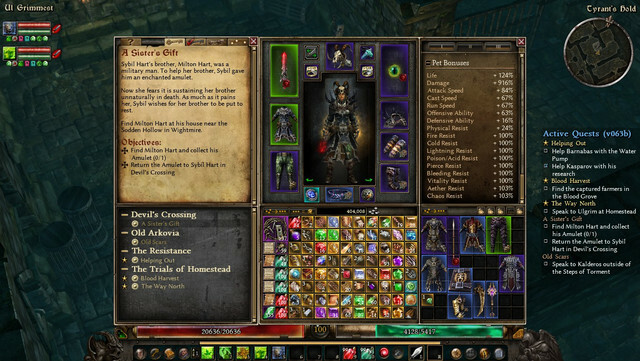 Rathma chest + gloves gives a great 20% pet Crit bonus while also taking advantage of the Chest's 5% DA, and Spear of the Dryad's high Cunning requirement and Cataclysm's Eye Spirit requirement give us good justification to wear the greatest of pants. Last edited by thepowerofmediocrity; 01-29-2019 at 11:30 PM. Do you think physical based build of nature+occultist would work? There would be sources of RR from plague, cof, and manticore at least. Since i don't have items for all these fancy full conversion builds in this mod. I'm not sure about rest of the devotions though. 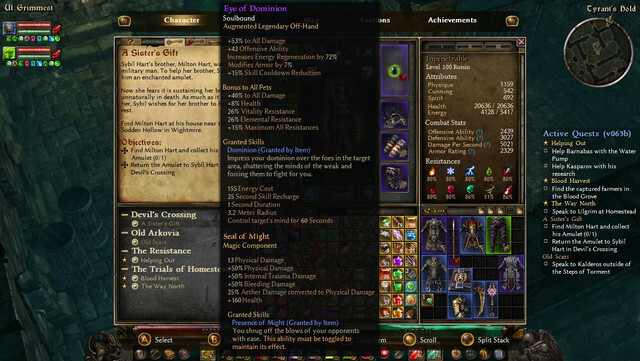 Build Objective: Create a pet build with Arcanist that makes good use of 22/12 IEE and combine Star Pact with Refresh for near-extreme CDR possibilities. 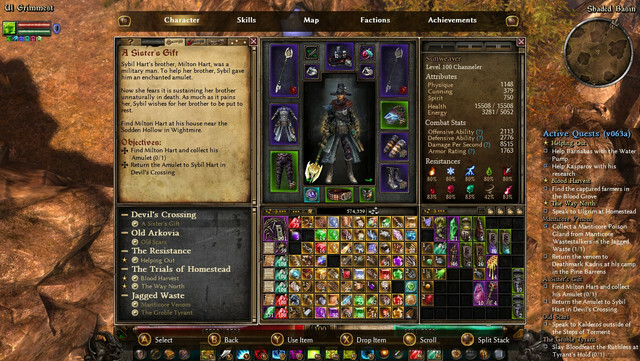 Pants: "Taskmaster's" Bysmiel Pants "of Soulwarding"
Medal: Satyr Craft with +Nature skills and suffix "of the Wild"
Arcanist is often delegated to sub-standard support category: not enough resistances for the player and only one skill suitable for pets. Then again - 25-30% Crit damage is amazing no matter the source. Vanilla pet builds incorporating Arcanist were mainly Lightning based builds, whether that'd be dual Raven Warlock or Beastcaller's Druid. 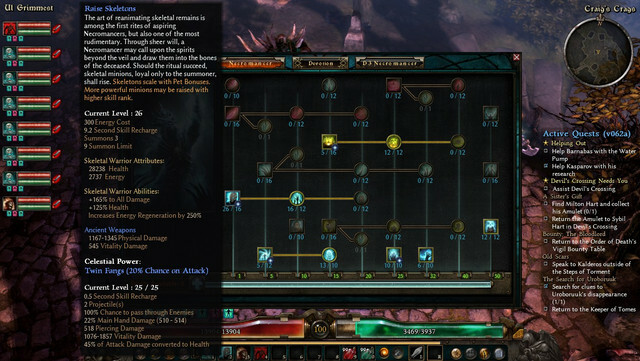 Grimarillion, however, multiplies the number of good concepts a pet build can take advantage of. The much more varied ways to get +All Skills is essential to getting the essential Arcanist skills down while grabbing the major pet skills, but the biggest addition to Arcanist builds is the Black Pearl Rings, which grant up to 24% Physical to Elemental and are craftable at the Satyr. 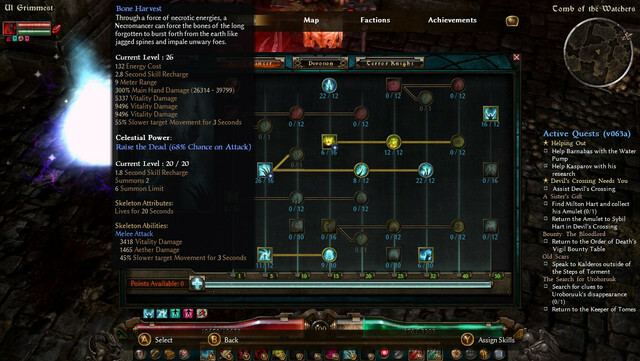 You can get a full 100% conversion if you use the Zunimassa's Set Off-Hand, but a staff that provides +2 to All Skills is much more valuable, especially as it cuts down on the amount of equipment neessary to get 22/12 to IEE. AoM was kind enough to grant two pieces of equipment that give bonuses to IEE as well as pet bonuses, and best of all, they are faction items. Black Pearl rings used to provide +1 to All Skills, but despite the nerfs, you only need Footpads of the Grey Magi in addition to the AoM faction items in order to get to 22/12 IEE, and with it - 114 Elemental Damage when Manifestation is taken. The other major benefit of choosing Arcanist as a pet Mastery is that the chest piece Fateweaver's Raiment gives relevant skill bonuses, and equipping it grants 15% to All Resistances for you and your pets. 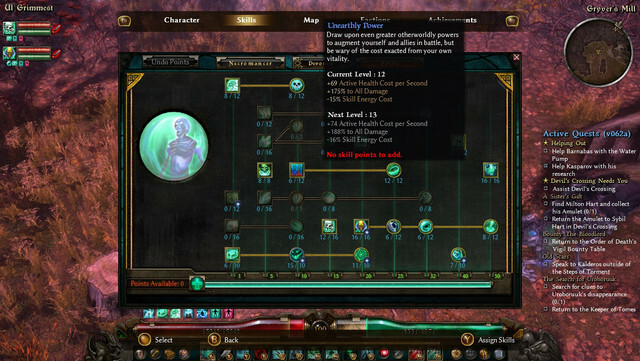 The +All Skills is very helpful in getting the other skills as well: Inner Focus allows you to get the Spirit neccesary to equip the Staff. Mirror and Nullification are the staple Arcanist skills where placing points into the ability allows you to use it more often. Maiven's Mirror + Conversion provide free damage absorption (it's not as if you're doing any damage for the penalty to matter) and Stun Resistance. Mental Alacrity gives you good Energy Cost reduction for just 1 point + bonuses. Finally, Star Pact is the original CDR Exclusive, and since Nature has no Exclusive ability, you feel no guilt in choosing it. The weakness of Arcanist Mastery is that you have no RR avilable for your use. OFF is much more useful in Grimarillion than in Vanilla as the amount of trash mobs susceptible to freeze is jacked up by orders of magnitude - more trash to freeze means more Fire RR stacking. As Tri-Elemental RR is hard to obtain and you only have a few skills that can even proc the abilities, I stack towards Swarmling's Fire Damage: Eldritch Fire for the RR, Magi for the Wolves to provide nice AoE capability, and Mogdrogen + Attak Seru for the T3 pet devotion + high DA stacking. While Mogdrogen is traditionally seen as weaker, I take it to take good advantage of the build's innate Crit damage potential while using the swarmling's temporary status to fish out as many attacks with them as possible. Due to the last of abilities to proc Mogdrogen, especially against bosses, I put up a Ishtak + Amatok build that provides similar numbers for pet Speed and OA. If you are thinking of using Hand of Ultos for additional RR, the multiplicative nature of the RR is far less useful when you are not stacked with multiple sources of stackable RR, so it is out. This build is made to glorify our little Nymph, as having 17/12 Nature's Wrath along with an additional 188% Elemental damage and flat OA thanks to the Kodoma is a big boost that you won't see in your stat sheet. In terms of flat damage, however, the Nymph still lags far behind Swarmlings, so I'm not sure whether Nymph is too underpowered. There is a bow that provides a second Nymph, but it is unsuitable for Elemental or Poison builds - it appears that it was meant to be used for Nature + Hunting Physical + Pierce pets. Still, with 41% CDR between Star Pact, Helm, Staff, and Amulet and Refresh to keep Force of Nature and Sovereign buffs up, you should be able to keep your focus on damage. Last edited by thepowerofmediocrity; 01-31-2019 at 12:51 AM. 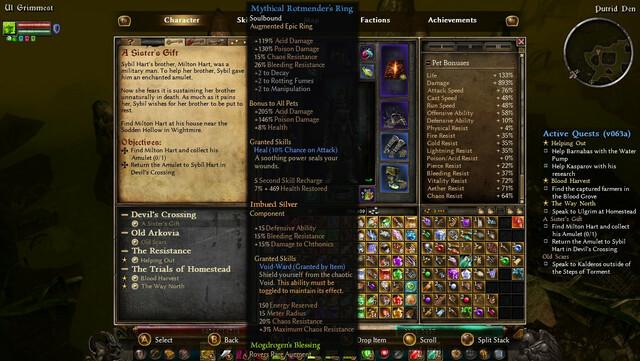 *NOTE: The only thing different between the Grimtools link and the equipment sheet is that the rings are Thoth's Mark, ring components are Purified Salt & Imbued Silver, and the Mender's Powder Augment is replaced with Mogdrogen's Blessing. If you think this is a nondescript pet build, I'd recommend looking at the pet sheet again; specifically, look towards the resistance column. That's right, pets here have 100% resist to all damage except Physical, meaning that in most cases, your pets are immune to damage. This is thanks to the combination of Eye of Dominion's 15% Max Resistance boost for pets alongside the 5% Max Resistance boost from the 2nd to last node in the Empyiron Constellation. Since the Empyiron constellation requires T3 affinities alongside 6 additional nodes, only builds that combine RR alongside the constellation route and flat RR from one of the classes can be worth using this devotion route. This build takes advantage of Nature pets' Physical damage alongside help from Terror Knight's Well of Fears great flat RR ability. 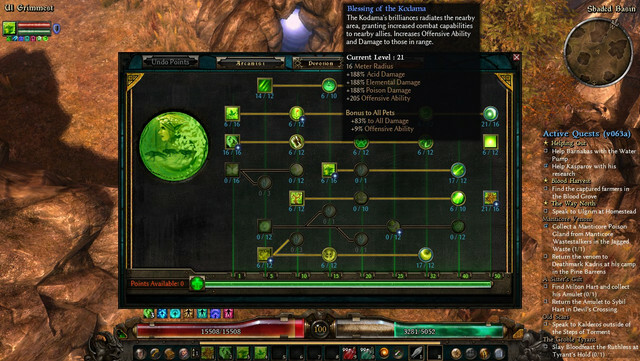 You will need one green item with the suffix "Of Caged Souls" to fill up your pets' Bleeding Resistance, so we place the green in the chest slot and combine it with GQ's ability to give +1 to Nature Skills for the prefix. This gives us enough skill points to be able to use Salazar's Blade (affixes don't really matter for the weapon, pet bonuses, Energy Regen, and DA are the important stats here). 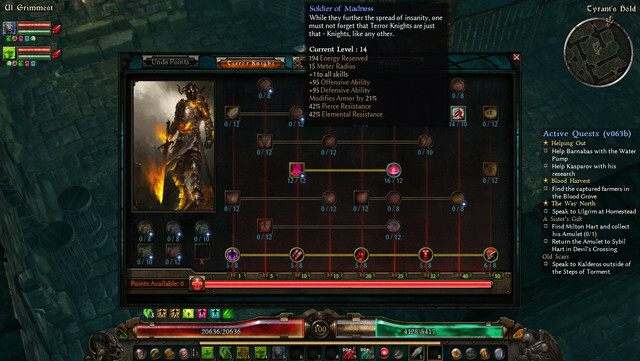 The +All Skills bonuses are important to get Terror Knight's Soldier of Madness high enough to get our pets' Pierce Resistance over 100%, as well as placing important skill points in Well of Fears so that the duration is as long as the cooldown so the RR is reliable. For damage, preying on enemies' weaker Physical Resist + hard-capping the Wolves and Force of Nature skills helps you hit decently while emphasizing immortality. 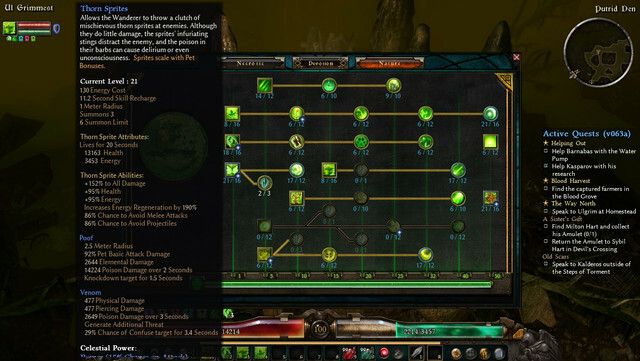 The Grimtools shows the pet sheet and resistance values, so if you're wondering how the pets have so much Resistance, look at the Grimtools. 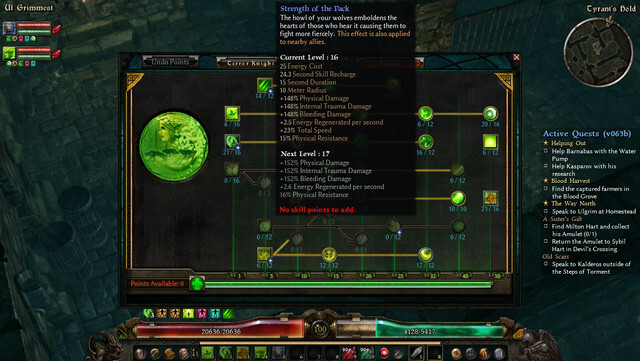 Pet Elemental Resistance is covered by Soldier of Madness and Heart of Oak (the third node) buffs, and Pierce resistance is also covered by Soldier of Madness. Terror Knight is the only class outside of the vanilla classes that has an aura that provides Pierce resistance, so we are fortunate that it also comes with good RR capability. Fifth Class Feature is Witch Doctor! Witch Doctor was given a hearty introduction with my first build in the Compendium, using the Zunimassa Set that gives +2 to Witch Doctor and makes Tiki Warriors quasi-permanent pets. Sadly, before D3's ultimate update that introduced the Kanai's Cube, the Zunimassa Set was the only way to get +All Skills in Witch Doctor, which is a shame since Witch Doctor is a heavy, heavy skill-point hungry Mastery, and that's true whether or not you make a pet build with it. Witch Doctor has multiple buffs, a passive to help with Energy Regeneration, 2 flat RR abilities - one for Elemental RR that gives Damage reduction and the other a standard RR ability, stackable RR that only unlocks when you have 12/12 invested in it and usually needs more than that for the uptime to match the cooldown, and Pierce the Veil- the great offensive buff featured in the Zunimassa build that grants an amazing Damage and OA boost in exchange for a massive Energy Drain that requires you to build around it. Thankfully, there are plenty of classes that grant passive Energy Regeneration and the devotion Harp - and if you need even more than that, Tree of Life - is a universal way to keep your passive Energy at manageable levels when in the heat of battle. Let's dive into the abilities themselves: Burning Dogs is largely invested because 16/16 increases the number of Dogs summoned from 3 to 4, and unlike most pet abilities, they are all summoned at once. A neat strategy with this is that if you see any of the Dogs weakened, direct them towards a target and re-summon all of them to pile on their Sacrifice damage. The damage is Physical, so you have to find a way to convert that damage, whether it be Cold through Winter King Sword, Elemental with Zunimassa + Black Pearl Rings, or Acid when FG comes out and you have access to Ghol's Malice set. You can summon even more Burning Dogs by killing enemies with Grasp of the Dead, but that requires heavy investment in Hybrid gameplay, and the Dog's mainly Physical damage does not sync well with Grasp of the Dead's Poison / Vitality damage. Gargantuan has a Poison cloud when you invest 16/16 in it, and Tall Man's Finger ring + Kunai Relic allows you to summon multiple Gargantuans at once. 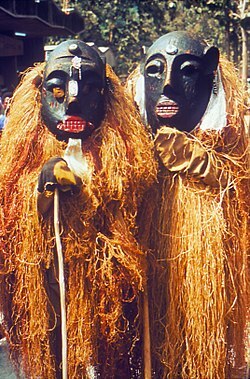 Tikis are usable even without the Zunimassa Set, but they are then used as a temporary pet similar to Conjure Primal Spirit. Even if you don't like looking for pet Stats, player-scaled Witch Doctors can summon multiple pets thanks to the Jade Harvester Set and its emphasis on Soul Harvest. The second node of Soul Harvest is the afore-mentioned flat RR ability, and the last node lets you summon Cold / Vitality pets if you kill enemies with the ability. Additionally, Corpse Spiders are also player-scaled, and you can summon many spiders to swarm the field as long as you have reasonable cooldown reduction. Phantasmal Blast and its second node are low in damage, but amazing for proccing devotion abilities due to the split projectiles. Mass Paranoia is a long uptime + long cooldown ability that grants Fire, Cold, Poison and Vitality stackable RR. Lastly, it's hard to mention Witch Doctor without promoting its great survivability. Walk the Plane is a Mirror-like invincibility ability that grants a small heal when you soft-cap the skill, and Spirit Vessel is a circuit breaker that heals you for half your health when you reach 30% Health. Overall, Witch Doctor is a great class that's slightly hampered by the sheer number of skill points and +skill bonuses that are required to make its abilities worth it, but amazing when you pair it with a less-hungry Mastery that helps with more RR capability. 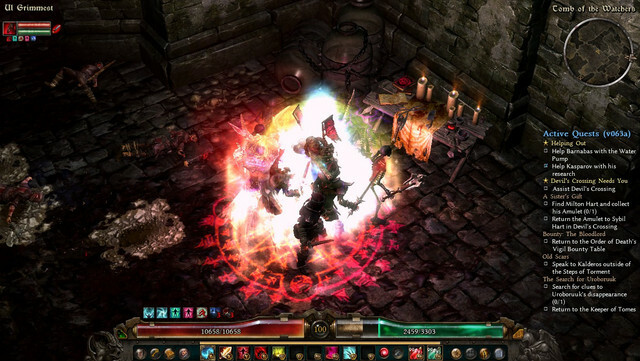 For those who are tired of seeing Pet stats and want to see builds that whack enemies on their own volition, Witch Doctor is the last of my class features that focus on summoning. 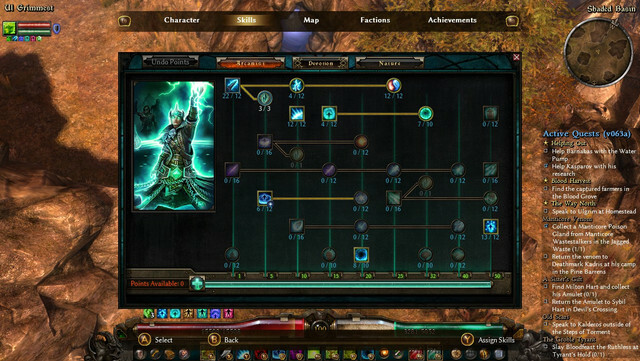 With the exception of one unrevealed pet build, all builds after this class feature will emphasize on good old-fashioned no-nonsense player-focused builds. There will still be pets, as is the nature of my compendium, but they will all scale with player damage, so you don't have to go out of your way to build around them, for when they benefit, you benefit as well.